The Marine Education Centre was developed by Marine Care Ricketts Point, and is housed within Beaumaris Life Saving Club. It includes interpretive signage and displays, plus audio visual equipment. This space is available to rent on a fee-for-service basis. Long time environmental education specialists,Gould League (est. 1909) run marine excursions for primary and secondary students, with discovery-based activities in and around the Sanctuary and Marine Education Centre. 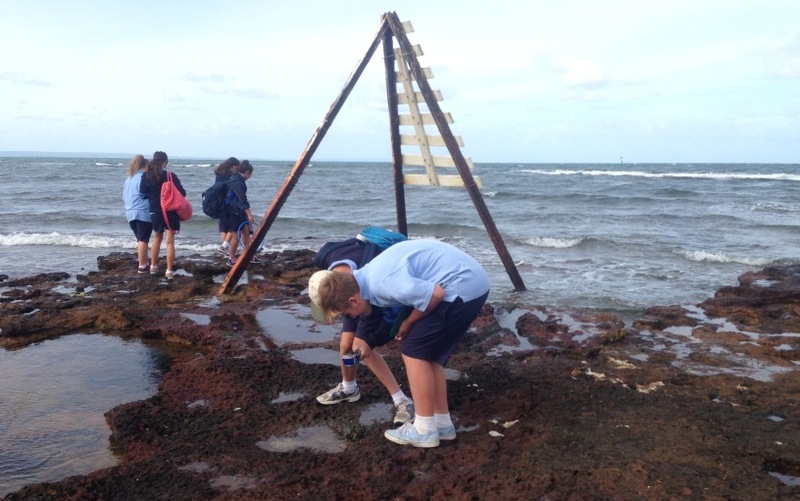 Students explore the beach, rockpools, marine artefacts and Marine Education Centre and learn how to minimise human impact on this ecosystem. MCRP has prepared teachers’ resources suitable for use by educators looking for “something different” to present to students, prior to a visit to the marine sanctuary. The resources should enable teachers to take self guided tours. You can print or download the articles listed below. MEC Introductory Panels A guide for teachers when talking students through the wall panel displays. MEC Teacher’s Resource A guide to teachers covering local Aboriginal history, foreshore plants, local marine life, some geology and a model view of the reef based life cycle. Script of Audio Plants Walk This script will enable teachers to take an informed beach walk, from the starting point of the Beaumaris Life Saving Club on Beaumaris Beach discussing most foreshore plants.This great resource was written and narrated by Rosemary MacLean.